Julie Schwietert Collazo talks with Elisabeth Suda, who creates jewelry out of bomb shards. AFTER LEAVING HER JOB in the Marketing Department at Coach, Inc., Elisabeth Suda traveled to Laos, seeking only to explore local craft-making. While learning about the natural dyeing work that women there subsisted on, Suda began envisioning other ways that design could assist rural Lao in earning more income. That idea led her to create the PeaceBOMB bracelet, made from the shards of bombs dropped during the Vietnam War. Not only does the material symbolically invoke the violence of the past, but it is meant to create hope for the future, and there is a material aspect to that hope, as well: the artisans are paid four times the market rate for the sale of their PeaceBOMB bracelets. Below, Suda explains how she brought this project to life. Matador: Why make jewelry out of bombs? Suda: I had heard that there was another special craft in this particular village: melting bomb metal and casting it into spoons. I was touched when I saw the artisans transforming bombs dropped by my country into spoons that are useful for their community, which eats a lot of soup! I learned that they had been producing these spoons since the 1970s and selling them on the local market to earn that much needed disposable income. In 2008, there was nothing like a bracelet made from weapons in the fashion market. Would people want to wear it? Sure, it was a gamble. An investment of our time. I told the artisans that I would purchase as many bracelets as I could afford. Together, we would try. And, back home in NY, I would begin to tell their story and the legacies of our shared war-torn past which left Laos the most heavily bombed country in history. It worked. Back home, people loved the bracelets and wanted to know more about the story. So, PeaceBOMB jewelry has become a way for artisans to become agents of change by doing what they already do, creating, but now with the right design for a new, international market. And it’s a way for consumers to do what they already do, shop, but now with greater purpose. In collaboration with the village artisans and our NGO partner, RISE Project, ARTICLE 22 :: PEACEBOMB bridges the gap between artisans and consumers. Matador: What, exactly, is ARTICLE 22? The declaration provides inspiration for the work that we do. ARTICLE 22, the social enterprise, is about collective action toward culturally and environmentally sustainable development to create positive change within our economically globalized system. It is about what we can do. It is about trade, not aid. Matador: How has travel influenced your work? For me, travel is having a new experience with a place, food, or tradition that has existed for decades, centuries, millennia. It is about something bigger than the traveler and that singular experience, which is impermanent. It is humbling because the place will forget the traveler, but it is up to the traveler to remember the place, the taste, the sound. Souvenirs help us keep these memories and sensations. Hand crafted souvenirs are my favorite because they are a little bit of the person that made it. Each is unique. Handcrafts have a certain aura because of their imperfections and limited quantity. Embracing uncertainty during travel is a big influencer on the design and creation process. A misunderstanding with language or a misread map can lead you to the “wrong” place. But being free from the stress of a straight path can make the wrong turn the right turn and open the way to new discoveries. Travel requires the ability to live in the moment, embrace those missed trains, and work with what’s at hand whether that’s a smart phone, map or merely a compass. When it comes to peaceBOMB product development, we are faithful to traditional methods, which often places constraints on what we can make. What we can do is less certain and requires experimentation. So, working within limits leads us to new discoveries and not only makes us resourceful, but also think different. Matador: What about the name PeaceBOMB? The name peaceBOMB describes exactly what our jewelry is: peace made from bombs. It is about taking a constructive approach toward the future. It is about bringing the bombs full circle–connecting a war torn past, with the present conditions of an underdeveloped yet culturally rich society, with a future filled with potential. It is about that very effort and international co-operation that gives consumers a way to join the artisans, take action, and make a difference. Matador: Do any of the profits from the sale of the bracelets go back to the community? Matador: What are your long-term goals with PeaceBOMB? To raise awareness about the need to ban cluster munitions and funds to clear a substantial amount of unexploded ordnance, or UXO, from Lao farms and forests since 30% of the bombs dropped did not detonate on impact. It’s all about the design. If the form and function don’t translate to the product, it almost doesn’t matter how compelling the story. Design and story must work together. 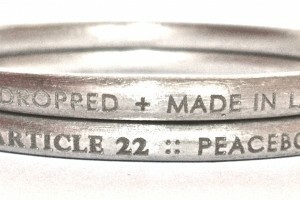 Other bangles from the engraved collection proclaim on the exterior: IheartPEACE and NYheartsPEACE. The heartPEACE Collection will grow as many new locations are added throughout the year. We’re also really excited about our heartPEACE collection which is a growing list of cities that heartPEACE. We’ve started with NYheartsPEACE. They bring local identity to the larger concept of peace. We all want it. First, we need to remember that and second, we need to figure out how to work together to achieve it. Two new made-to-order bangles are inspired by traditional peace symbols: the iconic peace sign and peace ribbons. Hand cast in New York, the sterling silver finishings are oxidized and then wrapped around the peaceBOMB bangle. Also new is the identification tag-inspired Tag Wrap Bracelet, which comes with two interchangeable leather cords and a peaceBOMB tag. Great unisex style to layer with bangles and other wraps. Necklaces are completely new territory for us. Our iconic ARTICLE 22 peacebomb tag is built into the closure of each design. The Story Charm Necklace tells the story from bomb to spoon. The minimalist Tribal Triangle and Bar Tag necklaces are a modern interpretation of indigenous aesthetic inspired in part by village weaving. The sculptural bomb shard is the only piece 100% sterling silver and made in NY. It is cast from a piece of ordnance that was removed by expert bomb technicians from the ground.